The Bee Hive: THURSDAY AND NO SURVIVOR TONIGHT! THURSDAY AND NO SURVIVOR TONIGHT! the vintage vinyl molded hair dolls that are about 8 -10" tall. The first try with regular yarn worked out to fit Josie, at 18". The second try, using baby yarn and a smaller hook fit 16" tall Margie. 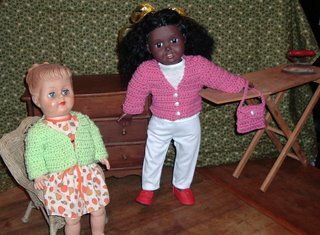 I don't really want to try it with the crochet thread, so my smaller dolls are going to have to continue to be wardrobe challanged for now. It is easy to find clothes for the 18" dolls in stores, and I can find some vintage doll clothes on eBay for the 16" ones, but it is extremely difficult to find clothes for smaller ones, except for a few 'baby' type items, but these are not baby dolls; they are like pre-schooler and early elementary age in style. My back problem is pretty much gone. It's still tender, but that's it. I can get up and down without much pain at all. But it seems I've traded back pain for a headache. I had one most of yesterday, and by last night it was really severe and I was terribly nausous, waking up several times during the night with the pain, despite aspirins yesterday and a napra-whatsit in the evening. This morning it was almost gone, but has come back somewhat as the day progresses. It's much, MUCH lessened from yesterday though. THose are the cutest little sweaters! I need you to make one for my doggie! *heehee* I can't find any to fit him. Thanks, Carrie and Jenna. That pattern really does work up 'cute'. But I don't think they'd work for a dog, unless he walks all 'sraddle-legged'. LOL! Oh Wanda Patti jo is a beautiful dog.it looks like you all taking great care of her.the blood work OUCH!. Thanks, Sue. It is just sad how someone can dump a dog and leave them to either starve, get run over or get shot. That blood work...Swoon-THUD! I can hardly stand to scroll past that photo. It creeps me out. I enjoy eccentricies, playing with art, getting totally, enthusiasticly turned on to new artsy activities, nature, native plants, dogs, folkways, history and learning more about things that interest me... Wife to one, mother to 5, grandmother to 6. QUIZ - WHAT COLOR GREEN ARE YOU?